Naval Station Great Lakes is the United States Navy's Headquarters Command for training. It is located in the city of North Chicago, Illinois, in Lake County. Naval Station Great Lakes is the largest military installation in Illinois and the largest training center in the Navy. The base has 1,153 buildings situated on 1,628 acres and has 50 miles of roadway to provide access to the base's facilities. The base is completely self sufficient from the civilian communities surrounding it, with its own fire department, police department, brig, and maintenance departments. 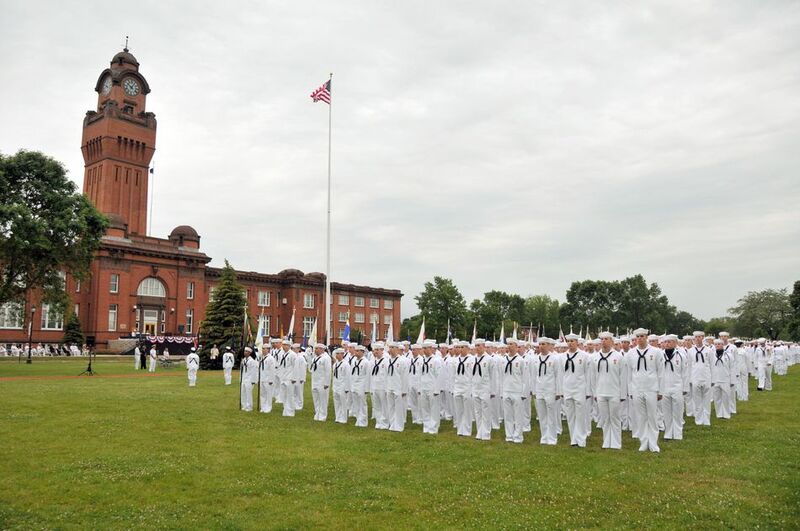 RTC Great Lakes has been the Navy's only basic training facility since 1994. Approximately 50,000 recruits pass through Great Lakes Recruit Training Command annually with an estimated 15,000 recruits onboard the installation at any time. Great Lakes RTC has been turning civilians into Sailors for over 80 years. Great Lakes is a pioneer in the racial integration of the Navy. In 1942, Doreston Carmen, Jr., reported as the first African-American for training in a general rating. Two years later, 12 ensigns and a warrant officer were commissioned here as the first African-American officers in the Navy. During the summer of 1987, the new Recruit In-Processing Center was dedicated in their honor with eight surviving members of the "Golden 13" in attendance. Naval Station Great Lakes is located on the shores of Lake Michigan, 1 hour North of Chicago, Illinois and 1 hour South of Milwaukee, Wisconsin. If arriving by plane from O'Hare International Airport, the Military Information Detachment is located in the USO facility at Terminal 2 to assist you with obtaining transportation to Great Lakes. The Airport Express has a van that goes to and from O'Hare. If arriving at Midway Airport look for the American Taxi company. They have a flat rate fee for coming to Naval Station Great Lakes.You can also take the Metra to Downtown, then transfer to the Chicago & Northwestern Line which comes to the Naval Station Great Lakes installation. The Airport Express has a van that goes to O'Hare and there you can transfer to the Great Lakes van. If arriving by auto, NAVSTA is located approximately 3 miles east of Hwy. 41 and approximately 15 miles east of Interstate 94/294 at US Rt. 137(Buckley Rd.). If you are driving north from Chicago, take Interstate 94 (north) to Hwy.41 Waukegan exit. Do not take the by-pass to Interstate 294. Take Hwy.41 north to Rt. 137. Make a right turn on Rt. 137 (Buckley Rd. ); go east approximately 2 miles. If arriving north from the Chicago area using the bypass Interstate 294 (north), to Rt. 137. Make a right turn on Rt. 137 (Buckley Rd.) and go east approximately 6 miles. If coming from Wisconsin, use Interstate 94 south. At Wisconsin/Illinois border exit onto Waukegan exit Hwy. 41 south (off ramp is on the left side of Interstate 94). Take Hwy. 41 south to Rt. 137; make a left turn on Rt. 137 (Buckley Rd.) and go east approximately 3 miles. Naval Station Great Lakes is home to over 4,000 active duty staff personnel and families, 14,000 recruits and students, 3,000 government civilian employees, and over 2,000 contractors. Naval Station Great Lakes provides services to Active Duty military, their family members and retirees, from a surrounding 16 state area. Major Commands are Naval Service Training Command, Naval Station, Recruit Training Command, and Training Service Command. Naval Station Great Lakes has 2 locations for temporary lodging: Navy Lodge and Navy Gateway Inn & Suites. Both facilities are open 24 hours a day, 7 days a week. When you call for reservations state that you are on Permanent Change of Station (PCS) orders. Contact the Navy Lodge at 1(800) NAVYINN or 1-847-688-2170, DSN 312-792-2170. Personnel in PCS status should make arrangements to stay at the Navy Lodge. If the lodge cannot accommodate, contact Navy Gateway Inn & Suites. Reservations can be made through the central reservations system by calling 877-NAVYBED (877-628-9233). You can contact the facility directly at 1-847-688-2170 or DSN 312-792-2170. Navy Lodges now allow pets with an additional fee and pets no larger than 50 lbs requirements for PCS families. Two pets may be accommodated. Application for assignment to PPV housing at the naval installation can be submitted to the Great Lakes Navy Housing Office upon receipt of Permanent Change of Station orders. Applications must be made on DD Form 1746 (Applications for Assignment to Housing), and submitted to the Navy Housing Office with a copy of Permanent Change of Station orders, Page 2 (Emergency Dependency Data Record), and Detachment Endorsement (NAVCOMPT Form 3067). Military service members applying for PPV housing at Naval Station Great Lakes must also complete and provide along with the DD Form 1746 housing application, a Sexual Offender Addendum Form, which can be obtained at the Navy Housing Office. This requirement is also applicable to service members applying for unaccompanied bachelor housing as well. Policy guidance regarding this requirement is contained in OPNAVINST 1752.3 and CNICINST 5009.3. Military service men, women, and/or their family members can acess the availability of PPV housing by contacting the Forest City Residential Management Office or the Navy Housing Office at 847-689-4312, Monday through Friday, during the hours of 7:00 a.m. and 6:00 p.m. There is a dog breed restriction policy associated to PPV housing assignment that prohibits the following breeds: Pit Bulls, Rottweilers, Chow Chows, Doberman Pinschers, German Shepherds, Siberian Huskies, and Perro de Presa Canarios. Bachelor Personnel in the grade E4 and above are authorized to draw BAH and live off base. All rooms are equipped with WIFI capabilities. Geographical Bachelors are berthed in double occupancy room with shared bathroom. Rooms have limited space and furnishings. Cable TV, DSL and telephone service is available but is the responsibility of each resident to set up a contract with the provider. A monthly utility fee is charged each GB resident. Space to house GBs is limited, please contact the Front Desk if intending on applying for GB status. There is Single military billeting available with orders. Single military service personnel interested in unaccompanied personnel housing (UPH) should contact UPH Gateway Inns & Suites (Central Billeting) at 847-688-2170 or DSN 312-792-2170. Families who live on base at Great Lakes attend North Chicago Community Unit School District 187 which serves students ranging from pre-kindergarten through high school. One-third of the student population is military dependents from Naval Station Great Lakes. For K-5 children, the primary school is Forrestal Elementary School. Middle School is divided between Novak-King 6th Grade Center and Neal Math & Science Academy for 7th and 8th grade. High-schoolers attend North Chicago Community High School, which offers a curriculum in college preparatory courses, industrial arts, vocational subjects and has special or enriched learning services. There is busing of students on the installation. District #187 has a uniform dress code requirement. North Chicago Consolidated School District 187 is located at 2000 Lewis Avenue, North Chicago, IL. Phone number: 847-689-8150. Students through eighth grade who live in government housing at Fort Sheridan attend North Shore School District 112 , Highland Park. District offices are located at 1936 Green Bay Road, Highland Park, 60035. Phone number: 847-681-6700. Students in grades 9-12 will attend Highland Park High School , which is part of District 113. There district offices are located at 1040 W. Park Ave., Highland Park, IL, 60035. Phone number: 847-926-9233. Students in government housing at Glenview go to Glenview Public School District 34 , Glenview. Their district offices are located 1401 Greenwood Rd., Glenview, IL, phone number 847-998-5000. Students in grades 9-12 will attend Glenbrook High School District 225 , located at 1825 Landwehr Rd., Glenview, IL, phone number 847-998-6100. There is busing for all students on the installation. Lake County is home to more than 100 private primary and secondary schools, as well as in neighboring Kenosha County, WI. Private schools vary widely, from highly structured to self-directed learning environments, to college prep and curriculum strong in artistic expression. Many private schools are church affiliated; however, they often welcome students of any religious background. You can obtain a list of registered non-public schools from the Lake County Regional Office of Education, 800 Lancer Lane, Suite E-128, Grayslake, IL, 60030-2656. Phone number: 847-543-7833. For information about scholarships, entrance requirements and waiting lists, parents should direct inquiries to the desired school. The Navy College Learning Center (NCLC) is located in building 617, room 216 and can be reached at 847-688-0524, Mon.-Thurs. 7:00 a.m.- 8:00 p.m and Friday 7:00 a.m.-4:00p.m. The center offers free instruction for Active Duty, Reservists, Retirees, and adult family members in self-paced computer based instruction on a variety of courses from math to work skills. Child Youth Placement (CYP) is a service offered by the Naval Station Great Lakes, Morale, Welfare and Recreation. The Child Youth Placement Coordinator assists parents who are looking for childcare within the Great Lakes area. The Child Youth Placement Coordinator will offer assistance that will provide you with information, resources and support to enable you to make a well informed childcare decision. Child & Youth Placement office is located in bldg. 3110, Phone: 847-688-3100; DSN 312-792-3100; Fax: 847-688-5617; DSN Fax: 312-792-3100. Hours of operation are Monday - Friday, 8:00 a.m. - 4:30 p.m.
For childcare in the Child Development Centers, Child Development Homes and School Age Care programs, the status of the sponsor determines enrollment eligibility. Eligible patrons include active duty military personnel, reservists on active duty or inactive duty for training, DoD civilian personnel, DoD contractors and active duty Coast Guard. In the case of legally separated or divorced parents meeting the above criteria, the child is eligible only when he/she resides with the military sponsor. All patrons requesting full time or hourly care must complete a DD 2606 Department of Defense Child Development Program Request for Care Record. Parents may complete this form to request child care on the Navy CYP Web site . In addition to form DD 2606, active duty personnel, reservists on active duty or reservist in training, and active duty Coast Guard will need to provide a copy of their orders and a copy of their child's birth certificate. Naval Station Great Lakes Child Development Centers (CDC) provide full time care for children 6 weeks to 5 years of age Monday through Friday from 6:00 a.m. to 6:00 p.m. For more information, you may contact the CDC at 847-688-3100. Fees are based on total household income, and a 20% discount is offered for families with more than one child in the Child Youth Program (CYP). Fees include snacks or meals if care is over a snack or meal period. Late Charge of $1 per minute up to 15 minutes will be charged. Hourly care is $3 per hour. The Child Development Home Program (CDH) is a quality in-home alternative to center-based care. The CDH providers offer care for small groups of children 6 weeks to 12 years old in a warm nurturing environment where children participate in developmentally appropriate learning activities. The CDH program office is located in bldg. 3110 and can be reached at 847-688-5498. School Age Care program (SAC) provides activities before and after school for children in Kindergarten-6th grade Monday through Friday 6:00 a.m. to 6:00 p.m. SAC also offers special holiday childcare options, as well as summer camps for children. Any eligible parent requiring care other than full-time care may use hourly care in the CDC or SAC. Reservations for care may be made up to thirty days in advance of needing care. The clinic is comprised of a health clinic and three branch health clinics. In addition, medical care is provided for 22,000 Service School Command students, learning one of several ratings. More than 4,100 Naval Hospital Corps School students also train annually at the command and receive hands-on clinical training at the Naval Health Clinic. The Naval Health Clinic, Great Lakes' mission also includes caring for an eligible 67,000 beneficiaries and retirees in the Northern Illinois and Southern Wisconsin region. Family members of active duty and survivors of sponsors who died on Active Duty, and who are enrolled in TRICARE Prime. Retirees, their family members and survivors enrolled in TRICARE Prime. Family members of Active Duty service members and survivors of sponsors who died on Active Duty that are not enrolled in TRICARE Prime. If the MTF still has Primary Care capacity after enrollment of all eligible members of priority groups 1 through 3, non-enrolled beneficiaries (groups 4 and 5) may continue to access health care at the MTF, on a space-available basis. Currently this hospital has a normal capacity for 131 beds.